Many Long Islanders, young and old, enjoy more than bicycling or ice skating, they enjoy skateboarding. Skateboarding has become increasingly popular among youth and many seem to want to skateboard all over the island. In 2007, legislation passed about banning skateboarding in various locations, including Nassau Community College. To be fair, skateboarding in public areas like universities or shopping areas are not the safest places to skateboard. Whether it is a skateboarder skating into traffic, skating into pedestrians, or getting injured, New York State and private skatepark owners know that skateboarders need a haven. Luckily, there are many public and private skateboard parks all over Long Island. If you are going to a skatepark or not, there are laws that need to be followed to protect skateboarders and anyone using a “foot powered vehicle” (including bicycles, rollerskates, and scooters). If you are under the age of 14 using a scooter or skateboard in Nassau County, you must wear a helmet. If you do not, the parent or guardian will be fined $50. In Suffolk County, if you are under the age of 17, you must wear a helmet. Violators will be fined $50. Wearing a helmet is for your protection; head injuries are very dangerous. A helmet might very well save your life. 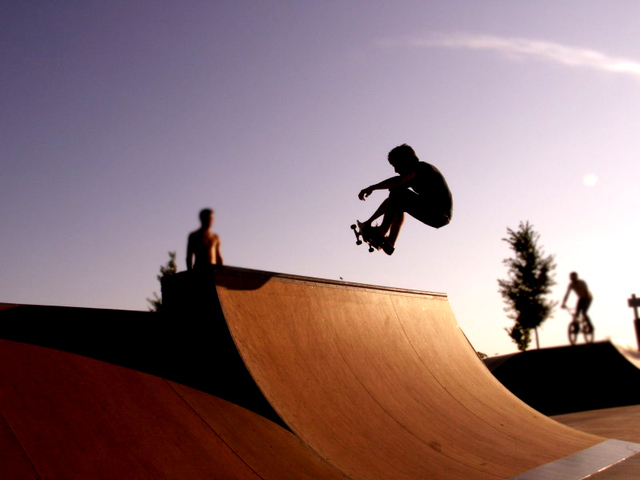 Located in Oceanside, this skatepark/skate shop has a lot to offer a skateboarder. From beginner to expert, this indoor skate park’s impressive layout with its 5 foot flybox, stairs, rails, and half pipes will have you doing flips and tricks. Oil City offers lessons, they can even host your birthday parties, or you can rent the entire park! All participants at this skatepark must wear a helmet. Fees and waivers are necessary for entry. See website for details. This Town of Hempstead outdoor skate park is very popular location for beginner, intermediate, and advanced skaters, because it offers a location for all those levels. The park includes ramps, quarter pipes, half pipes, bank ramps, spines, and a grind rail. Bleachers for spectators are included of this 11,000-square-foot facility. Skateboard and inline skates are permitted in the skate park. No bicycles are allowed. All skaters have to register and if you are under the age of 18, you need a parent or guardian with you. Only children 7 and older are permitted on the equipment, those who are 10 and younger must be accompanied by an adult at all times. All of those who are skateboarding and inline skating must wear safety equipment. This all concrete street course includes a 40 foot wide mini ramp with spine and a high vertical ramp. All skateboarders are required to wear helmets and pads. Greenport Skatepark also has an annual skate park festival for spectators and skaters. This newly remodeled skatepark reopened in 2013 for eager skaters to enjoy once more. The park features ramps, ledges, grind bars and more! The park is currently closed and scheduled to re-open April 22, 2016. The skate park is part of Greenlawn Par. The 9,200 sq. ft. skate park offers a lot to beginners and advanced skaters. Even scooters and bicycles are permitted on the ramps, wedges, grind boxes, rails, quarter pipes, and half pipes. Helmets are required at all times, although pads are optional. Bellerose Avenue, between Larkfield Bellerose Avenue, E. Northport and Old Bridge Roads. This outdoor skate park in Northport offers a 9 foot and 11 foot deep concrete bowls in addition to the banks, stairs, rails, and ledges. Rollerbladers are also permitted. BMX bikes are prohibited. With its kidney-shaped pool that offers an 11-ft. deepend and a 6-ft. shallow end, this small skate park by basketball courts and baseball fields will provide a lot of afternoon fun for the avid skater. Helmets are suggested. This skate park opened in 2012. It is a flow skate park that is about 15,000-square-feet. Helmets are required at this park. Skate Spot is Manorhaven's skate park that opened in 2011. It features launch ramps, ledges, stairs and rails for skateboarders of all levels to safely enjoy. This state-of-the-art skate park includes many ramps, ledges, grind bar, and stairs. All skaters must wear helmets, wrist guards, and pads. Registration is required for children 8-17 with parent permission. No children under 8 permitted. Columbus Avenue & Pulaski St. This skateboard, rollerblade and BMX skate park offers residents and non-residents a place to to skate. There is a daily pass and annual pass available. All boarders, scooter riders, and bladders must wear helmets and pads. Wrist guards are recommended, but not required. This 15,000-square-foot outdoor facility offer areas for every level of skateboarder. With its asphalt color-coated basse, half pipes, vert wall, above ground bowl, and street course, this is a skater’s paradise. Helmets and full pads are required. This skate park requires all person to wear safety gear. Skate park not supervised, so skate at your own risk. The park is closed on Tuesdays and during inclement weather. If you know a great place to skateboard here on Long Island, and think it should be added to this list, let us know! Email us at here!